With the recent partnership between KCB and Jumia Online Shop,its now possible to easily pay for online purchased goods from the vendor through KCB app and KCB mobile banking. Jumia is the most successful online vendor in kenya and the wider African continent, providing a wide range of commodities like electronics,kitchenware, fashions and much more. The other popular online shop in Kenya is Kilimall. In a move to offer customers the best of discount offers this festive season, KCB also went into business partnerships with other goods and service providers including Chloride Exide Limited, AutoXpress shops,Mabati Rolling Mills,Furniture Palace,Doshi & Company hardware limited, Kentainers Innovative Solutions,Space& Style, East African Cables, Furniture Elegance, Uniform Distributors, Textbook Centre and Crown Paints Kenya limited. 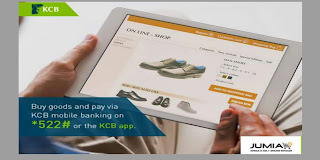 Note that this service is available to KCB mobile banking registered customers.The customer can choose to use the USSD code *522# or download the KCB Banking App to pay for goods online. Finally you'll receive a message from Jumia confirming that you paid for the goods.